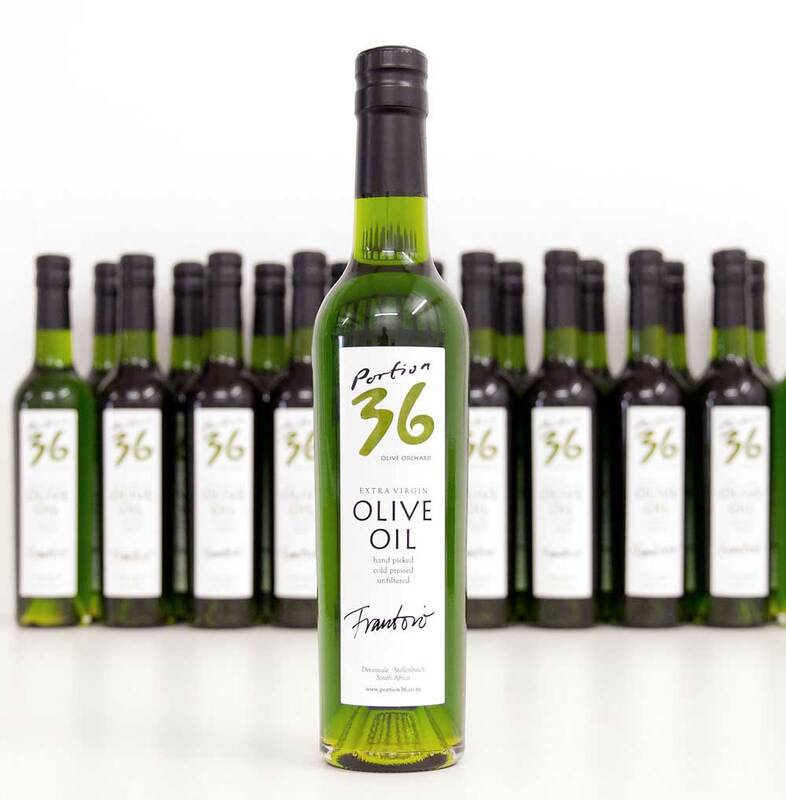 Portion 36's Olive Oils are Hand Picked, Extra Virgin and Cold Extracted. We farm our orchard kindly, organically and waterwise. Healthy trees produce healthy olives that makes good quality oils and table olives. We press our oils on the farm, the olives travel a few hundred meters from the orchard in to the press and are oil within hours from when they were picked to ensure the best quality and freshest olive oil. We make single cultivar olive oils. We pick, press and bottle each type of olive separately. Our oils give you the opportunity to explore and find the olive oil of your taste and liking since different olives have very different characteristics and people have different tastes and like different flavours. Olive oils can be very exciting sensations of flavours and, it is always possible to make your own blend. At Portion 36 Olive Orchard we grow 5 different oil olive cultivars: Coratina, Frantoio, Leccino, Favolosa (FS17) and Delicata (I77). Coratina, Frantoio and Leccino are classical Italian cultivars. They are often blended, especially Frantoio and Leccino. All three of them are big oils with lots of fruit, bitterness and pepperiness. The Favolosa is an oil similar to Frantoio with lots of fruit but more gentle with the bitterness. In pepperiness it is as sharp as the Frantoio though. The Delicata is like its name - a delicate oil, mild and round with hints of vegetables like artichokes and tomatoes. Picking the olives unripe make little - but intense - oils. Because we handpick all olives we can decide which olives go into the press and which ones we leave for later. The same tree can be picked several times during harvest which usually lasts about 2-3 months and we have picked and pressed another crop of both the Leccino and the Frantoio which turned out to be as flavourful if not quite as pungent as the Early Harvests. The olive's ripeness is a major factor in determining the taste and quality of the oil. Green, unripe olives make a more intense, green oil. The olive's freshness is another factor that influences the taste and quality. Our olives are pressed the same day as they are picked and the oil is stored stainless steel tanks by cultivar. Most people look for the term Extra Virgin in olive oil. This is a guarantee that the free fatty acids level in the oil is less than 0.8 percent, the peroxide level is less than 20ppm and that the oil is free of defects. It is a minimum quality standard that you should always insist on. As extraction technology has improved it has become recognised that the standards for Extra Virgin are too low - it is now possible to make oils with far higher quality. This has resulted in a move to create a new class of olive oils called Super Premium. To qualify for this the free fatty acids level in the oil must be less than 0.3 percent and the peroxide level must be less than 7.5ppm. All Portion 36 Olive Oils meet these criteria. An oil with this guarantee has been extracted at a temperature under 27 degrees C.
We do not filter our oils, we like to keep as much as possible of the natural flavour from the olive. As a result the oil may appear cloudy or even have a small harmless sediment. We sell our oils in both clear and black bottles. Olive oil is sensitive to light, air and heat. Any bottle should be kept in a cool, dark place. Every bottle has a unique hand written label that tells you which olive the oil is made from and when it was harvested. Unlike wine olive oil does not improve with age. The fresher, the better tasting the oil. However, good quality olive oil is a stable product and stored in a cool, dark place it can have a lifetime of up to two years from harvest. Portion 36 still recommend that our, and other oils are used before 18 months to get the full appreciation of this wonderful product - olive oil. Like with any food, look, smell, taste - and open your heart to olive oil!